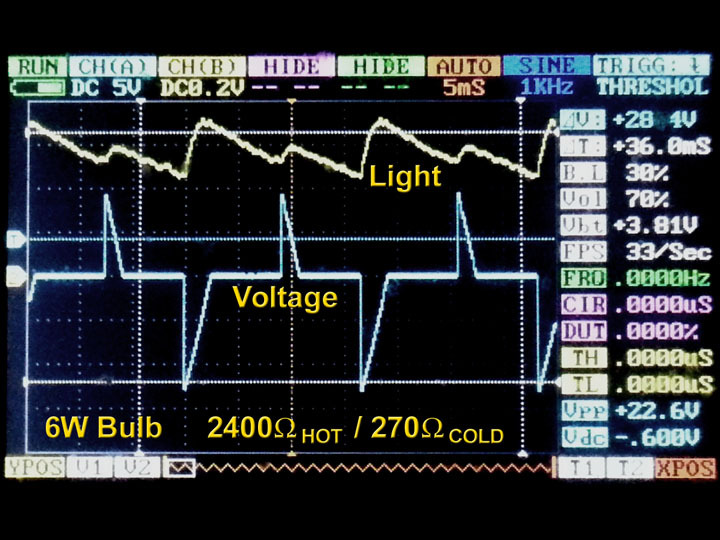 There are some concerns that the chopped up waveforms from a TRIAC driven circuit, will stress an incandescent lamp. Here are the results of some tests conducted on both a small 6W “nite-lite” bulb, and a standard 60W bulb. Below is a 60W bulb, with a improvised dimmer, set fairly low. The results show a calculated resistance of ~100 ohms. No big current spikes. The current follows the voltage. 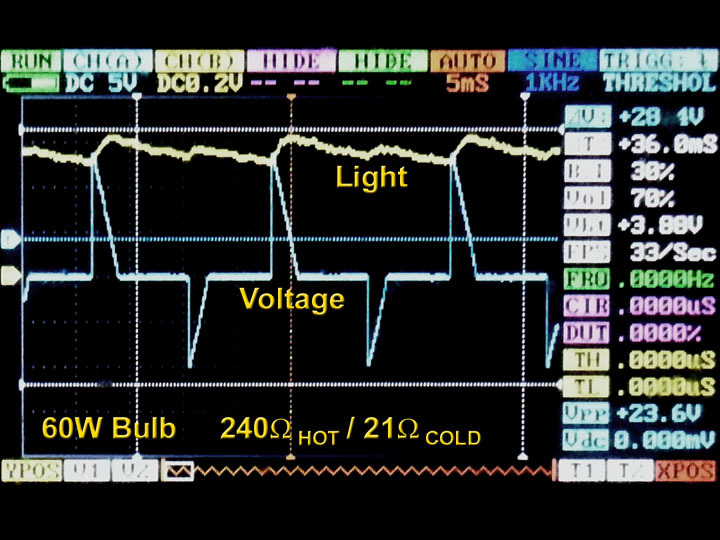 The following is that same 60W bulb, but now the upper trace is measuring the output of an amplified photo-diode, that’s picking up the light from that bulb. This detection circuit has a high bandwidth, somewhere close to 100KHz. The slow droop is actually the filament slowly cooling down, and emitting less light. From its droop rate, I estimate its time constant to be in excess of 60mS. The light ripple appears to be around 15 to 20%. Also note the resistance of 240 ohm. when subjected to the full 120V, and the of only 21 ohms, when its cold, and measured with an ohmmeter. Even very dim, the resistance climbs to 100 ohms, in the first photo. Below is the results of the 6W nite-lite bulb. The brightness ripple appears to be over 35%. The time constant is also faster. Looks to be a tad over 30mS. 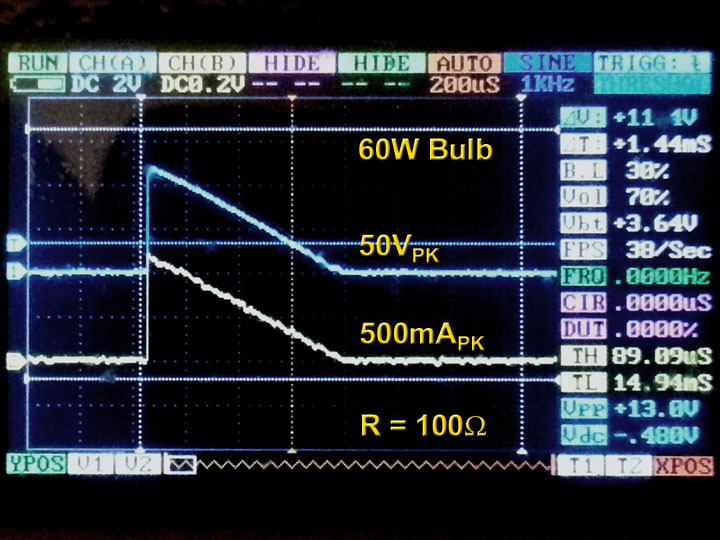 When I took a current and voltage reading off the scope, with a dim setting, I measured 72V peak, and 50mA peak. This results in a resistance of 1440 ohms. The rated hot resistance is 2400 ohms, and cold, off an ohmmeter, it measures 270 ohms. 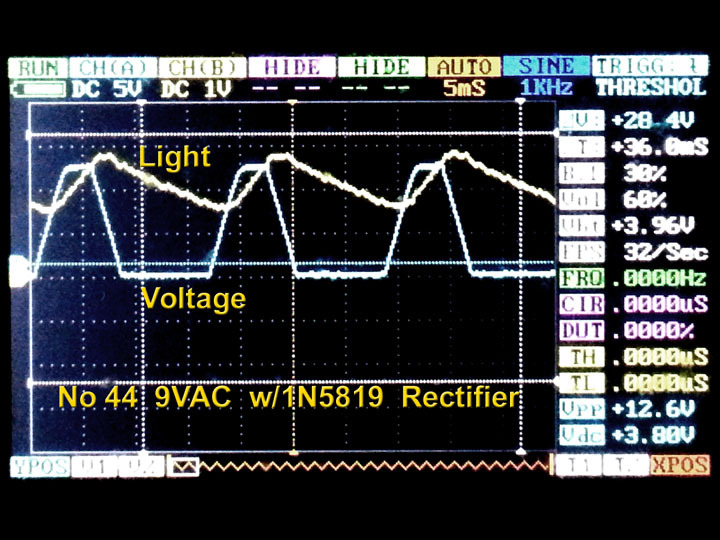 Again, the current follows the voltage, with no big surge. 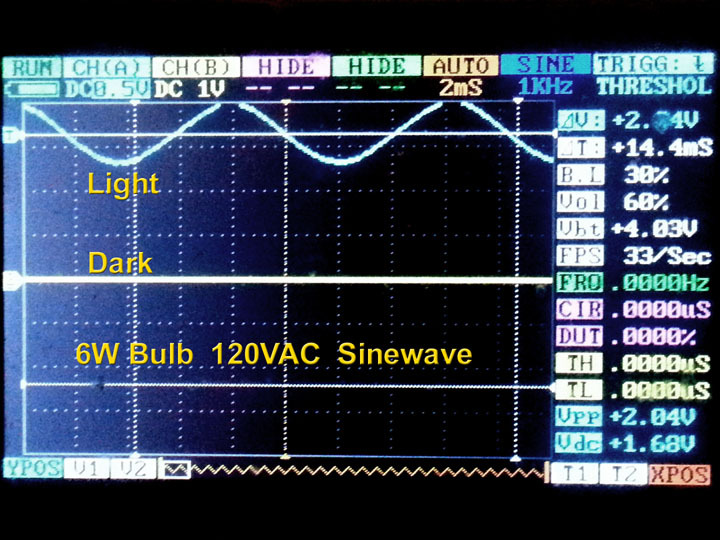 Above is a reference measurement, with 120V applied to the 6W bulb, with no added circuitry. The light ripple is a 120Hz sine wave. Its amplitude is also ~35%. 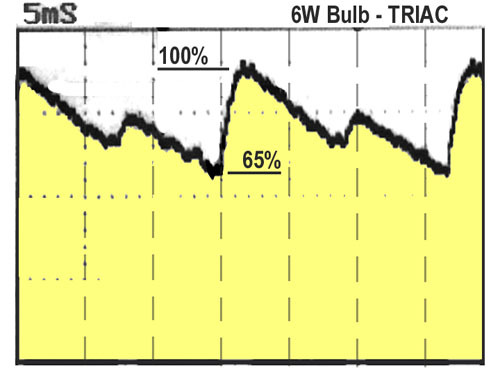 From what I measured, it appears that the TRIAC drive doesn’t hurt a incandescent filament. Photodiodes are very fast responding devices. They can see variations well down into the nanosecond range. The limiting factor, here, is the op amp. Though the MC34072 is a relatively fast op amp its still inexpensive. 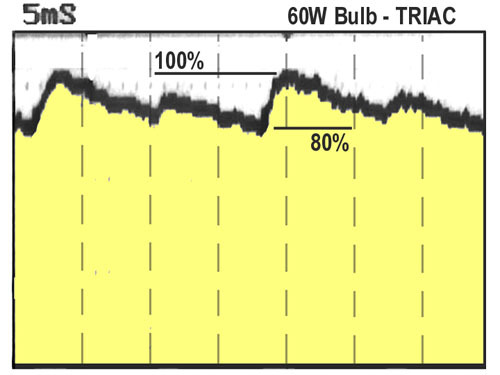 For the 60W bulb, there is only 20% variation, off the peak. If we wan to fudge we could split the difference, say the nominal light output is at 90%, and it varies +/-10%. 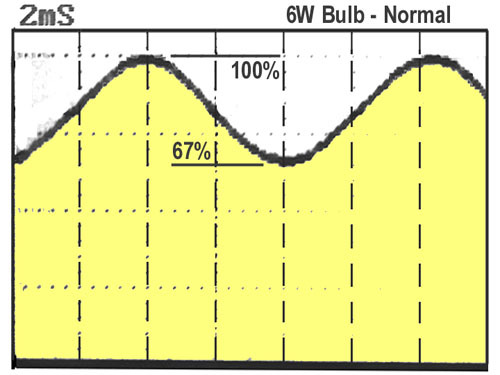 For the 6W night light bulb, the light output drops to 65% of the peak. Again weaseling out, we could put the nominal level at 83% with +/-17% variation. For Reference, the 6W bulb straight off the 120VAC. Note even here, the low is 67% of the the peak. Or +/-16% variation, off the nominal value. There still is almost no difference versus the TRIAC figure.